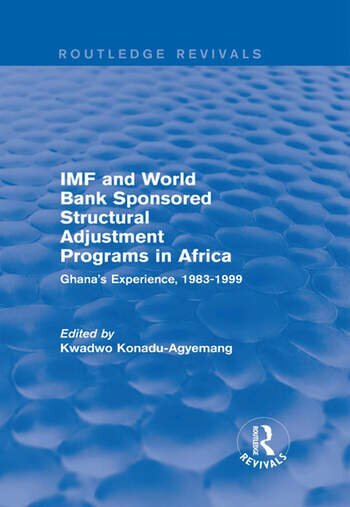 This title was first published in 2001: Bringing together geographers, planners, political scientists, economists, rural development specialists, bankers, public administrators and other development experts, this volume questions the benefits of Structural Adjustment Programmes (SAPs). It critically assesses the impact of SAPs from a wider perspective than a purely economic one, highlighting concerns about impacts of adjustments on the more vulnerable elements of society such as social welfare, the environment, labour, gender and agriculture. Revealing both the costs and benefits of the economic restructuring programme, the book also suggests alternatives to current development models, and how SAPs can be made more sustainable. An original and comprehensive addition to the collections of both students and practitioners of development. KWADWO KONADU-AGYEMANG is an Assistant Professor in the Department of Geography and Planning at The University of Akron, Akron Ohio.USA. He had his undergraduate education in Ghana, graduating with a BSc (Hons) Land Economy Degree from the University of Science and Technology, Kumasi, Ghana in 1981. He earned his Master's (1987) and Ph.D (1991) degrees from the University of Melbourne and Monash University, Melbourne, Australia, respectively.